In Kyrgyzstan, as in other places, nomadic culture has been developing over millennia. From long experience, nomadic peoples learned to live in harmony with nature — because for them, exhaustion of the natural resources they relied upon meant collapse of their community, of their way of life. The entire arrangement of their lives — public structure, customs, handicraft skills, traditional knowledge, daily life — was permanently devoted to moving and living in different areas according to seasons and the condition of the pastures used by livestock, their main source of livelihood and welfare. The nomad’s migrations were not chaotic, but mostly strictly arranged. The land areas (pastures and other arable lands) were adopted by families, which united into villages (aiyl). All relationships — between aiyls, inside aiyls, and with the natural environment — were regulated by common law (adat) which was based on traditional knowledge. “The foolish shepherd could overgraze pasture in one day,” posits a traditional Kyrgyz saying. Nomadic Kyrgyz had long ago learned to sense the condition of the pastures and changes in the climate. In ancient times, they were already aware of 11-12 year cycles that correlated with important processes in the climate and related natural cycles, which became the basis for oriental calendars. Grassland ecosystems are complex and include groups of species with different ecological requirements. In wet and cold years, certain species flourish, and in dry and warm years, others are the ones to thrive. This complexity meant that natural fluctuations of climate did not impact on the general productivity of pastures, nor the diversity of species. However, in the case of overgrazing, the ensuing degradation hinders an ecosystem’s ability to react adequately for fluctuation of moisture and temperature regimes. Obviously, today’s changing climate systems — such as altered precipitation trends and glacier loss — do not help matters. According to Kyrgyzstan’s Second National Communication to the United Nations Framework Convention on Climate Change, released in 2009, modeling has indicated that significant reduction is likely under all of the “most probable variants of climatic scenarios”. Indeed, the report predicts that the country’s glaciated area will shrink by between 64 percent to 95 percent over the next 100 years. “Last year, you could not even see the glaciers on the mountains,” confides Dootkasy, a Kyrgyz shepherd. The current poor condition of Kyrgyzstan’s grasslands is worrying for today’s shepherds, as it demonstrates deep and long-lasting negative changes in the environment. In former times, over 50 years ago, grasses grew higher and thicker. They were more diverse. In such pastures, cattle gained weight quickly. The deterioration of pastures began in Soviet times when too many cattle were grazed in the mountains. Today, short and thin grasses, including more plants that are unfit for cattle rations, are more prevalent. Now there are fewer cattle, but the pastures are not recovering. 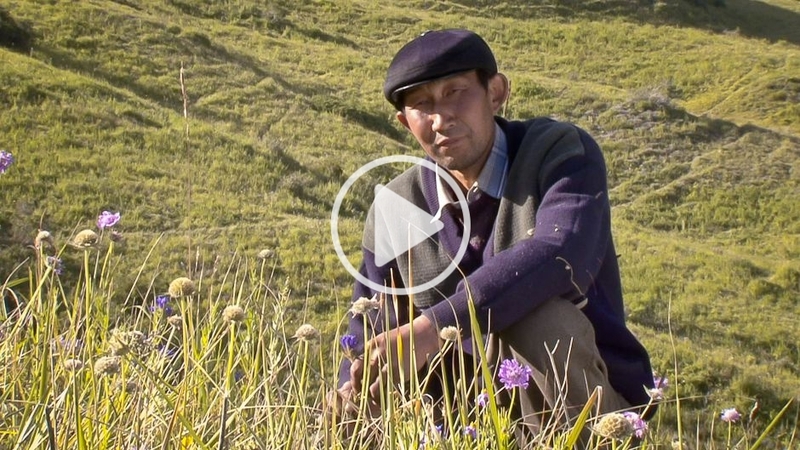 In the video brief that accompanies this article, shepherds Sariev Dootkasy and his wife Anarkul Bakirdynova share their observations and adaptations to the changing climate in the highland pastures of their homeland in Kyrgyzstan’s Tian Shan Mountains. They notice a decrease in rainfall and see firsthand that the glaciers are retreating. “Last year, you could not even see the glaciers on the mountains,” Dootkasy says. The increasing dryness means less food for their animals, which has such consequences as a decrease in the milk produced by their mares. They also know that the devastation of pastures and forest ecosystems began a long time ago when the rules of interaction with nature were first violated. Traditional practice was based on established knowledge, and certain rules helped preserve the quality of the grassland ecosystem. For example, a taboo against early grazing came from an awareness that the grasses’ roots must be given enough time to grow after winter because premature grazing could damage the pasture, turning it muddy and unable to support as much livestock. Dootkasy says he tries to keep a strict pasture schedule, relying on traditional knowledge. However, he admits that not all shepherds are able to honour the old wisdom, due to technical shortcomings and economic pressures. Nowadays, the Dootkasy family must move further and shift their pastures more often to feed their livestock and themselves. As a result of declining precipitation, Kyrgyzstan’s arid and semi-arid zones that are unfit for grazing are expected to increase dramatically over the next century. Unfortunately, nomads in regions like the Tian Shan Mountains will continue to be challenged by decreasing biodiversity and a loss of productivity in their traditional ecosystems. The Aleine Ecological Movement aims to help the shepherds fight land degradation and adapt to the changes in climate. By reviving the traditional knowledge of nomadic peoples — regarding seasonal pastures, grazing times, and the composition and quantity of grasses — the movement hopes to boost agrobiodiversity, which will in turn support the livelihoods of nomad communities. This video brief was produced by the United Nations University Media Centre’s Citt Williams in association with the Aleyne Ecological Movement of Kyrgyzstan and The Christensen Fund. Finding A Place To Feed: Kyrgyz Shepherds Suffer Pasture Loss by Emil Shukurov is licensed under a Creative Commons Attribution 3.0 Unported License. Emil Shukurov is a member of the Monoldor tribe from Inner Tian Shan. He is a professor at the International University of Central Asia and chairman of the Aleyne Ecological Movement of Kyrgyzstan. Professor Shukurov holds a doctor of geography and a PhD in biology. His areas of interest include ecology, biogeography, conservation, education, culture, and traditions.